We are having a revamp of the business a series of small changes to make a whole lot of difference. A good old sort out of time & space here at Made With Love and as part of those changes Social Networking & Social Sharing widgets are being implemented making it easier for customers to the site to share their finds on their preferred social networking site. Time & time again, we have wonderful emails and comments for happy customers telling us how happy they are to have stumbled across our site & how much they love our stuff. We’re not all that easily found in cyberspace and so when people ‘find’ us, we want to make it easy for them to spread a little love. – Set Up A Twitter Account and make daily relevant posts – DONE Why don’t you follow us? 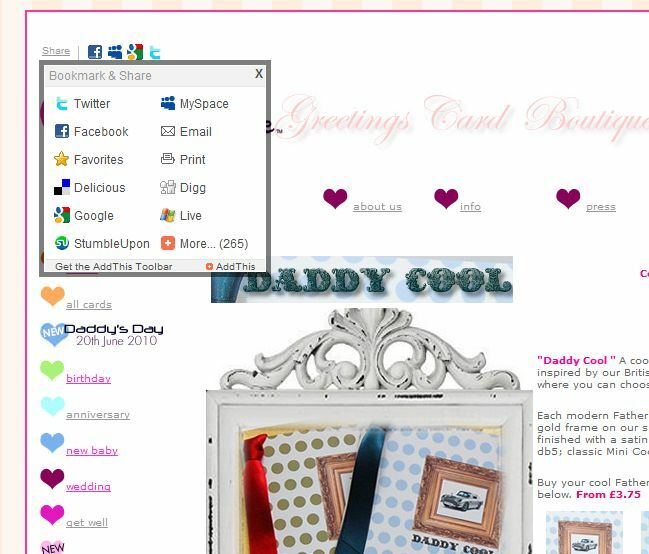 – Apply Social Sharing Icons to the website for AddThis (applying code to all web pages to allow visitors to the site to tell their friends and post our lovely cards or stationery items of interest to their profiles). This is really effective and has already seen results. All really small tasks that are going to help in promoting our handmade lovelies to even more beautiful customers.